Back in February I showed you my kids’ money jars. We still love our jars and they are still working perfectly for us. I have had a few questions about how my kids earn money, so I thought I would share a few of our ideas with you. “Allowance” is the typical term for giving our kids money (we use this term, only for the lack of not having a better term to use.) Allowance for some kids is money they get for doing nothing. At our house, allowance has to be earned. We have a pre-determined amount of money that the kids can earn each week based on their ages. We have tried 1/2 their age each week. So, my 10 year old has the possibility of earning $5 a week. They are responsible for doing their chores, homework, piano practicing, etc… We made a chart where they can mark off what they have completed. (During the summer, we slacked off on the marking down part. We are in the process of getting back into this habit since school has started.) The amount they earn fluctuates by how well they completed their responsibilities. My older 2 kids, ages 10 and 8, are awesome about writing all their money down and doing the math to figure out what to put in each jar. 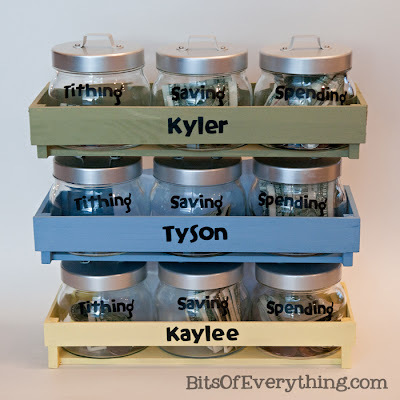 They love seeing their savings jar getting more and more full! Another way to determine the amount earned is to give a certain amount, like 5 cents or 25 cents (depending on age), per job completed. I found this to be a little more work, but it could be more accurate to the work finished. I enjoy listening to Dave Ramsey‘s Podcasts. I really like the tips he gives about teaching your kids about money. Here are a few of his suggestions. *Put Children on commission instead of an allowance. Reward your children for completing jobs around the house by giving them a commission. The amount of money depends on how much work is finished. *Make a spending chart. You and your child should decide how to spend and save his or her money. A certain percent should be saved and a percent should be given away to a charity or church. *Set goals on how much money to save to buy things with cash. Working to buy things gives kids more pride in themselves. *Spend money wisely. Teach children that spending money on items that last is a better investment than buying items that do not, such as candy. I don’t feel like I can properly teach my kids about money and how to work with money unless I give them an opportunity to use money themselves. Hands on experience is how I believe they will learn the most valuable lessons about money. To me, that is money well spent.